Jen at Bakerette is back with another winning recipe for us! We are so excited to share her latest creation with you. 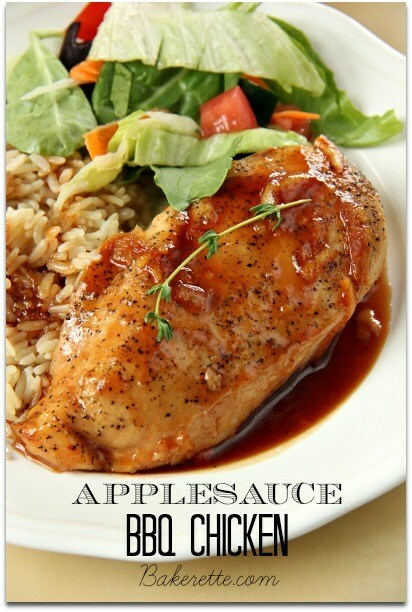 The subtle flavor of apple makes this applesauce BBQ chicken stand out from the rest. The bonus is, you only need a few ingredients to create this sweet and savory dish. Are you looking for a quick BBQ chicken recipe? 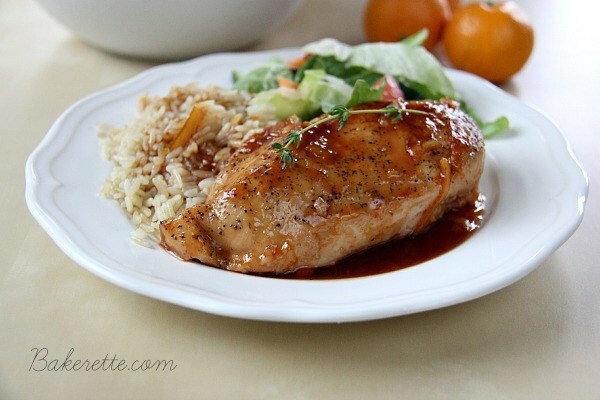 I love this easy BBQ chicken flavored with applesauce. My dad is quite the connoisseur when it comes to barbecue recipes. He’s often out at the grill concocting some kind of barbecue chicken recipe that is dripping in a chicken marinade. I loved dipping my finger in the bowl to take a quick lick of this simple BBQ chicken marinade when he wasn’t looking. He was too busy with his brush swishing the sauce back and forth onto the chicken. Although this barbecue recipe isn’t cooked on the grill, the simple applesauce BBQ marinade tastes like it is! On medium heat, warm olive oil in a large skillet. Season chicken with pepper and place in skillet. Brown chicken on both sides for about 7-10 mins on each side (depending on thickness of chicken, you may need to cook it more or less). Make sure not to blacken the chicken. Meanwhile, combine remaining ingredients and pour over chicken and cook the last 10 minutes or until a meat thermometer reads 170 degrees Fahrenheit. Thanks Jen! Looks delicious. We love the idea of year round BBQ!